Chaos Created is pleased to announce the release of its Royal Wedding activities and games that we were commissioned to make by TES and TSL Learning. 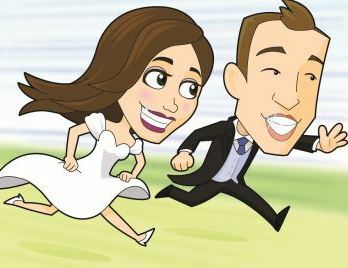 These activities were developed for Key Stage 1 and Key Stage 2 pupils and are the first in a series of Royal Wedding activities that will be released by Chaos Created through TSL between now and the royal wedding which takes place at the end of the month. 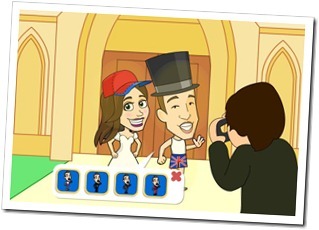 A fun TESiboard interactive activity to dress Kate and William for the Royal Wedding. Click on the bodies to change clothes, and on the heads to choose a hat. Click anywhere on the background to change the surroundings. When happy with the picture, click the photographer to take a commemorative photo. A great activity to discuss with children why they made their choices and possibly for a writing task using the image as a starting point. This TESiboard activity, themed to the Royal Wedding, supports Literacy objectives for KS1. Prepare an equipment and ingredients list and then sequence the instructions for making a royal wedding cake. A TESiboard sequencing activity which can be extended into journalistic writing for KS2 pupils. Sequence the mixed-up filmclips of the royal wedding onto the timeline and press play to hear your news report. The images and (optionally) the text can be printed out to provide an off-screen sequencing and/or writing activity. Ask pupils to listen to the style of commentary and see if they can improve on it. Make this fun by writing a joke version where things go wrong! The Word doc has scenes from the activity in different formats for further sequencing, time ordering or writing tasks. We have more games and activities coming later this week (keep an eye on this page) including some monarch history activities, wedding meal planning activities and interactive reference books. Keep an eye on our blog for more details or like us on Facebook.